Ver 1.55 Chinese PLA Mod, based off the Wasteland Mercenaries mod. 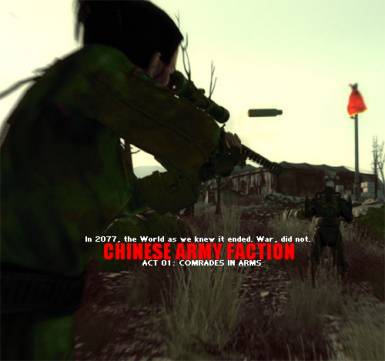 This allows you to recruit Chinese soldiers to fight across the wasteland and expand China\'s borders. lulz. Enjoy. -J.W. Chinese PLA Mod, based off the Wasteland Mercenaries mod. Credit is due to him. The read me files is rather short so read this. This allows you to recruit Chinese soldiers to fight across the wasteland and expand China's borders. lulz. Enjoy. First time modding, so critiques are welcomed. Perhaps I'll be working on a Chinese campaign mod in the future. -Normal Soldiers are riflemen, there are specialists and such. They carry Chinese assault rifles and such. -Spec-Ops, or Special Operations commando wield more fancy weapons. Some even have a nuclear launcher. Should play with the Fallout III reborn mod, and on hard for the most awesome Chinese vs Enclave action, since World War III. -Chinese PLA Faction mod has been expanded into a base. Please note that you can no longer find the Political Officer at Rivit City or Megaton, but rather inside a Chinese base. -Attempting to begin a campaign. If you want to help out and contribute, please message me. -Enjoy! I spent alot of my springbreak on this. -Operation Anchorage users should download new version, base version i.e. version III. -Non Operation Ancorage users can play around with the first version, by visiting the political officer either at Megaton or Rivit City. -The Great War 2077. As the bombs drop, the world explodes into flames and countries disappear forever into history. A lone tactical carrier submarine makes a desperate dive to the bottom of the ocean off the east coast of the United States. It's nature not of American origin, it's mission unknown. -Enter Fort Sichuan: Fort Sichuan is a Chinese Outpost, located in the capital wastelands near megaton. The 8th Route Expeditionary Force has been dispatched a few months ago before the vault 101 incident. Taking what supplies were left from the commando raids nearly two centuries before, and learning whatever necessary to withstand the hellish wastelands, the 8th Expeditionary Force represents the tip of the PLA spear in post-nuclear apocalyptic Washington D.C.
-Enter, you: At first glance, the Chinese are a hostile invading army. But World War III has ended a century ago? Has it not? There are no countries left for old soldiers. They have not shot you on sight. What is their task here? One of ruthless conquest? Or one of peaceful reconciliation? Is War unchangeable? Or is it natural for man to continue their mission of self-destruction? A call for comrades in arms! -Know how to do missions? -Willing to help me on my mod?